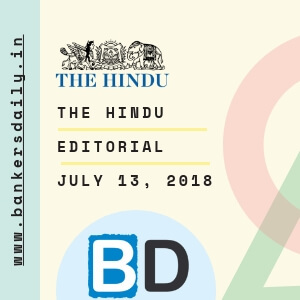 THE HINDU EDITORIAL – January 23, 2018, is one of the must-read section for the competitive exams like IBPS Clerk 2018 Mains Exam, Canara Bank PO – PGDBF 2018 and IBPS SO 2018. These topics are widely expected to be asked in the reading comprehension, Cloze Test or Error Detection in the forthcoming exams. So gear up your Exam preparation and learn new words daily. The multi-month low retail and wholesale inflation prints for December pose an interesting challenge for policymakers and the central bank. Inflation in Consumer Price Index (CPI), at 2.19% in December, is at an 18-month low, while the WPI, at 3.8%, is at an eight-month low. The Reserve Bank appears to have been blindsided by the CPI number, which is way below projections made during its last few monetary policy pronouncements. The RBI has maintained a CPI projection of 4.4-4.8% for the second half of fiscal 2019. Even in the October policy announcement, the bank projected 3.8-4.5% retail inflation in the second half with upside risk, and even changed its policy stance to “calibrated tightening” from “neutral”. The MPC and the RBI may well want to reassess the robustness of their inflation projection mechanism in light of the data coming in. When the new Governor, Shaktikanta Das, sits down with the monetary policy committee (MPC) in early February he may well have to return to a “neutral” stance given the soft trends in headline CPI. There may even be pressure on him to look at a rate cut, especially given the weak economic data coming in — factory output growth was a low 0.5% in November with manufacturing showing a contraction. The automobile industry, the first to feel the effect of an economic slowdown, has seen sales falling over the last two months. The inflation data have also thrown a curveball at policymakers in that their different components show divergent trends. So, while headline CPI inflation is trending lower, core inflation is still sticky at close to 6%. Again, there is a divergence between core rural and urban inflation — the former is trending higher at 6.34% while the latter is heading downward at 5.26% in December. Curiously, rural health and education index numbers are high. The point with all this divergence in data is that monetary policymaking is a challenge. Governor Das alluded to this in a recent speech where he pointed to the divergences and volatility in different sub-groups as a major challenge in inflation assessment and projection. But the broader question is whether the interest rate structure is lagging behind the big structural change in inflation in the last few years. According to Mr. Das, headline CPI inflation has moderated from around 10% in 2012-13 to 3.6% in 2017-18 and 3.7% in April-December this fiscal. Yet the nominal interest rate structure has not changed significantly, leading to rather high real interest rates. Prominent policymakers, including principal economic adviser Sanjeev Sanyal, have called for the RBI to take a re-look at the interest rate structure. It will be interesting to watch how the RBI under the new Governor reacts to these calls. As expected, the array of presidential hopefuls for the 2020 U.S. election has widened considerably on the Democratic Party side, with at least eight candidates declared running, another six likely to run, and a further eight potential entrants sitting on the fence. Some analysts put the total size of the potential Democratic aspirational pool at 34. The latest addition to the list was Kamala Harris, a first-term Senator from California and daughter of Indian and Jamaican immigrants. Ms. Harris enters this crowded arena with the heft of her star power, having accumulated considerable political capital through her tough questioning of President Donald Trump’s cabinet nominees — including then Attorney General Jeff Sessions, who admitted that being grilled by Ms. Harris made him “nervous” — and other notables. Nevertheless, she was beaten to it by the New Year’s Day announcement of Massachusetts Senator Elizabeth Warren, a top-tier Democrat who also took on Mr. Trump over policy issues but attracted criticism for an unnecessary controversy over a DNA test to establish her Native American ancestry. While it is likely that the two Senators will remain on the ballot when the first state, Iowa, heads to the primaries in early February 2020, most entrants between now and then are expected to drop out as their popularity and donor-support figures come into sharper focus. That is the real question at the heart of America’s complex Democratic primary: why are so many candidates throwing their hats in the ring at this juncture, and what does it tell us about the challenge that the ultimate nominee will pose to Mr. Trump’s re-election prospects? First, whoever wins the nomination will inherit the burden — and benefits — of the considerable anti-Trump sentiment that is swirling across diverse pockets of the country. An early indication of this likely outcome lies in the fact that most prospective candidates have announced policy positions that are situated in the centre-left of the American political spectrum, positioning themselves against Trump on immigration, health care, criminal justice and more. An example of such a policy position is Medicare-for-All, which not only Ms. Harris and Ms. Warren, but some newcomers too, such as Julián Castro, the former mayor of San Antonio, Texas, consider a part of their core agenda. Second, the Democratic universe is enthusiastic about this race as Mr. Trump not only lost the popular vote in 2016, by 46% to 48%, nearly three million votes, but also, currently, has the worst net approval rating of any post-World War II U.S. President. However, a big challenge that looms for Democratic candidates is to gauge the way independent voters, who often keep their voting preferences secret from pollsters, lean. These voters were the undoing of Hillary Clinton in the Rust Belt states, and they could again tip the scales back toward the nativist populism of their Commander-in-Chief. Meaning : present or constitute (a problem or danger). Meaning : declare or announce in a formal or solemn way. Meaning : the way in which someone stands, especially when deliberately adopted (as in cricket, golf, and other sports); a person’s posture. Meaning : consider or assess again, in the light of new or different factors. Meaning : the quality or condition of being strong and in good condition. Meaning : the process of becoming smaller. Meaning : propel (something) with force through the air by a movement of the arm and hand. Meaning : suggest or call attention to indirectly; hint at. Meaning : fail to keep up with another or others in movement or development. Meaning : openly or formally asserted or announced. Meaning : a person or group that enters or takes part in something. Meaning : having or characterized by aspirations to achieve social prestige and material success. Meaning : gather together or acquire an increasing number or quantity of. Meaning : in spite of that; notwithstanding; all the same. Meaning : cause to come to a place or participate in a venture by offering something of interest or advantage. Meaning : achieve permanent acceptance or recognition for. Meaning : one’s family or ethnic descent. Meaning : a particular point in events or time. Meaning : the possibility or likelihood of some future event occurring. Meaning : receive (money, property, or a title) as an heir at the death of the previous holder. Meaning : a sign or piece of information that indicates something. Meaning : expected or expecting to be the specified thing in the future. Meaning : having or showing intense and eager enjoyment, interest, or approval. Meaning : an apparatus for making fabric by weaving yarn or thread. Meaning : a greater liking for one alternative over another or others. Meaning : make or become wider.